Hearing Aid Technology | Beck Hearing Aid Centre, Inc.
Today more than ever, hearing aids are becoming increasingly advanced, thanks to top-notch research and a passion to meet patient demand. Two popular products available for those looking for higher-tech experiences are Bluetooth hearing aids and rechargeable hearing aids. At Beck Hearing Aid Centre, our hearing instrument specialists are trained to fit and tune both Bluetooth and rechargeable hearing aids. Our patients can choose from a number of options from the leading manufacturers. Bluetooth is a wireless communication platform that can transfer data between two more electronic devices. Bluetooth technology relies on radio waves to create a high frequency through which data can transfer quickly, securely and without interference. Bluetooth-enabled devices are very common these days, including smartphones, music players, computers, tablets, televisions, car stereos and more. Bluetooth hearing aids have filled an important gap in the hearing aid market. Before they were available, those with hearing loss often had to remove their hearing aids in order to be able to listen to headphones. 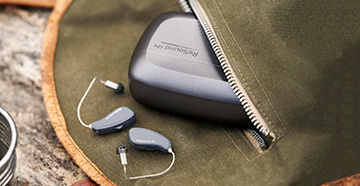 Now, Bluetooth-enabled hearing aids can connect with other Bluetooth-capable devices, making for seamless and streamlined hearing, regardless of your environment. Hearing aids shouldn’t prohibit you from being able to enjoy and take advantage of today’s best communication technology and devices. 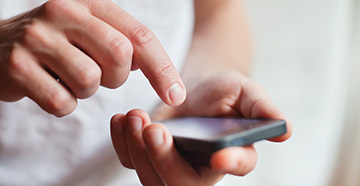 Bluetooth-equipped hearing aids enable those with hearing loss to easily stay connected to smartphones, televisions, tablets and more. Rechargeable technology has been available for a while, but many hearing aid manufacturers struggled with making a battery that could last for more than a few hours. Now, recent innovations have paved the way for rechargeable hearing aids that last up to 24 hours, providing day-long power without the hassle of disposable batteries. Each manufacturer offers a slight variation on this battery, providing hearing aid wearers a wide choice of hearing aids that will meet their hearing loss, budgetary and lifestyle needs. When it comes to hearing aids, it’s important to select not only the right style for your particular needs, but features, as well. With directional microphone, multi-setting, Bluetooth and rechargeable options, you can rest assured you will find the right device at Beck Hearing Aid Centre.